Upto what time in your order can you add more options? to the point now it no longer has one, its just listed as a 'factory order'. So i was wondering as it looks like it may even be March or later before i get it build prob around end of Feb. Could i add more options or will that meen the dealer putting a new order in? YOu can amend the spec with no problems until the car is build confirmed, what you thinking of adding. I have every option available on my current GTI! I was thinking of adding. total of ~£1370 extras on top of what i originally had. I have hummed and harred over the leather but i see too many downsides, (cold in winter, hot in summer, have to look after it, saggs and creases and goes shiny with age). I liked it in the car i test drove in July but it did give the interior a dark feel and monotone look. The cloth i think brings a bit of colour to the interior. The audio will in time be topend aftermarket (im into the soundoff soundquality audio mega bucks seen) so ruled OEM audio upgrades out. Do you any recomendations that i may have missed? Just read this, do you think there dealer simply did not want the hassle or maybe got confused between build week and confirmed build week? I know this person ordered the same time as me (end August) the week before the price rise in September. maybe that had something to do with it? Or maybe because all they wanted was only £115 extra the dealer did not want the hassle? Yeah if you want to add extras do it now before you get a build week. I tried to add the luxury pack a week after placing my order and it was too late. The car had been locked into the system with the additions I'd opted for at the time. Mind you I'm glad I didn't get the lux pack now as it doesn't have the electric fold mirrors on lock up that I'd hoped for, so saved myself £120 or somesuch sum. The first guy I called said as soon as the car had a production week it was then frozen in the system and nothing could be altered. That was due to the car having the extras all lined up for that particular production line. I asked, was there no way for the car to be even unfrozen, the extras added to the order and the car put back in to the system and maybe slipping back build weeks, a week or two. To which he said no, it would have to be cancelled and completely reordered. I don't want to cancel the order as my dealer gave me a good price for my trade in even although my trade in would be worth a lot less by the time the golf arrived. Dealer phoned Germany and sent a fax or at least he told me that. He was told as soon as it has been issued with a build week it is basically allocated to the factory along with the spec it is to be built to and is literally frozen in the system. With a couple of thousand cars a week going through their system / factory they are unable to change any orders without unfreezing them first which means the car comes out the slot it has been allocated to and you then have to start again with a new order. The only way to jump the queue is if the dealer already has a car waiting to be allocated without a buyer then you can be allocated that one as long as its not got a build date. Unlucky for us the golf is proving to be popular so every car already has a buyer!! My extras were an after thought. My dealer does not seem the most helpful in the world so far, so basically i want to be armed with concrete facts before i challenge her to maybe add to my order. Do you think its the dealers above and customer service misunderstand the system? as i know alot of things get misunderstood in the trade and also alot just want a simple life? I originally ordered mid August so i know i have left the options late but i was thinking due to the extra delay i should just treat myself. This is what my dealer says my order is currently at well on Tuesday last week anyway. "At present the factory have not yet scheduled in to a build week"
"there is no scheduled built date"
"it just shows factory order status at the moment"
"Looks like it has gone back with the build week but I cannot confirm this with you as the factory status only says factory ordered." I use to have a provisional build week of first 46 (from her understuidy) then it slipped to 48 (VW Customer Care) then to 50 (VW CS) now it does not list one (so dealer lady says) unless she looked in the wrong place? Then minus the discount i got before. So basically do all the sums for her i may get the extra options? Is 'build confirmed' the same as 'confirmed build week' ? I don't see why you can't add anything up until it is frozen production. We certainly wouldn't have any issues with it. The biggest trouble with ACC is that you need to do a fair few miles in one over familiar roads to appreciate the difference, I have now done over 6k in mine and I can now tell the difference between all modes if you covered up the switch and I didn't know what mode it is set on. It is very good when you have family in the car it does soften the ride on comfort quite a bit over harsh bumps. I think if you choose to add the 18's I would seriously consider it as I find the ride harder than the mk5 on 18's, I don't think it is far behind the mk4 R32 for hardness. I personally prefer the harder ride although it is nice sometimes to be able to soften it for those lazy days! I have not really done enough miles in one with 17's on as yet to compare, however the mk5 on 17's and 18's was very different. To sum it up, 18's with ACC, 17's probably not bother! I got a phone call today from one up from the person i was dealing with. I have added the options (except the 18s) i think i did anyway not sure what happened in the end, but they asked for an extra £500 deposit (I paid £500 originally) because of the price of them i think he said, Seemed odd but i forgot to ask more about it as i got distracted by the next bit that came out. I could understand a long build time for something a little bespoke / unusual or exotic but we're talking about a Golf! I think I would have cancelled my order on principle by now regardless of my desire for the car. Build delays and wanting the extra VAT - a VW issue imo! That was a point i was trying to get across to him. That the only reason i wanted to add these options was to help ease the wait alittle. To stop me feeling really p1ssed off. I could live without them but if im waiting over 7 months i may as well have it a bit different from OEM! It seems looking on another forum GolfGTI.co.uk that a few of the August orders are getting the VAT rise paid and other things like a hire car after a 20week wait. I just feel sh1t on from a great height at the moment. I thought of cancelling i must admit but i have paid out ~£800 already and if i do cancel it will probably help them out as they could look good to someone else by slotting them into my build week! I wouldn't be waiting that long for a Golf, I'd ask for my money back, they can't refuse as they keep breaking the contract by moving the delivery date. Take your money elsewhere, don't reward poor service. Whilst in the dealers last week I was chatting to one of the salesmen. I mentioned that I'd read a lot of cases of delayed builds on the web. - VW UK have to block book the number of build slots/cars they think they will need with the factory a year in advance. - VW UK have used up all their build slots and have to go back to Wolfsburg a beg for more. - Wolfsburg say they can only have a handful of extra slots meaning the build weeks are getting pushed back. Which all sounds very plausible. Question is when will VW UK get their hands on a decent quantity of slots? Assuming the new build year begins in January, when did VW UK decide how many 2010 slots to book and how many did they go for? Well i did not amend my order. Because i want this vat thing sorted first and i can live without them if need be. I really don't see why i should have to pay the extra ~£500 the VAT rise will be, because VW did not fulfill there contract and deliver in the time scale they quoted. They say in the home market they are offering to fit the RNS310? monocrome satnav just to get cars out the factory. LOL, vw audio is so bad I would rather them leave a gaping whole in the dash, knock £300 off the car and i'd put the money to a decent double din Alpine /Kenwood / Pioneer nav jobby with bluetooth. My dad's got the RNS510 in his MKVI Golf. 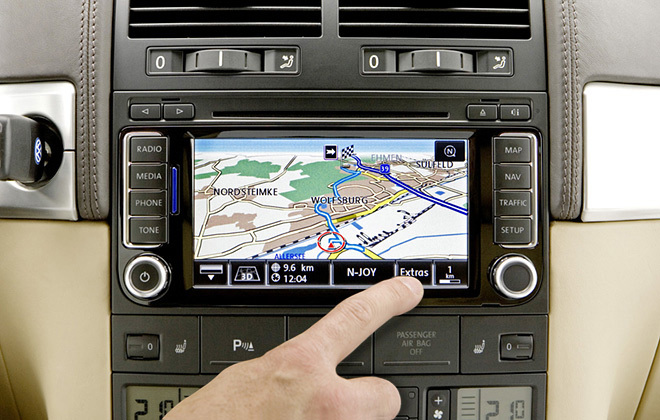 The Sat Nav (MFD2) in my GTI was shite as well. It looked the part, but it's functionality/accuracy is not a touch on the Navara's built-in system. I'm really surprised that Tom Tom / Garmin haven't pushed their products harder with manufacturers for oem systems. IMO they still lead the way. Due to my broker/fleetdealer, even after asking many times for them to phone VW to ask if they could compensate in some way for the 6 month wait, (3 months longer than i was originally quoted) and not doing or seeming willing too all i get is computer says.... Im currently reviewing my situation. I really do think its a cheek of VW to also say they will only pay the extra VAT till 28th FEB. I have a Quote they should stick to that price, everyone else in buisness do! To not offer compo of some sort (after a 12 week+ extra delay), to even allowing people to register there car in March as a token! for the extra wait! So making there car look 6 months old in less than a week of ownership! Thats great VW, i use to be a fan a huge fan.